Dissolve the cornflour in a little cold water to form a smooth paste. Bring the raspberry purée and sugar to the boil then add the paste. Mix and simmer for a few minutes or until the purée doesn’t taste of cornflour. Whisk the egg whites till stiff, gradually adding the sugar during the whisking process. Mix ⅓ of the meringue into the raspberry base, and then fold in another ⅓ followed by the last ⅓ of meringue. Generously line the ramekins twice with butter then coat with a dusting of sugar. Fill the ramekins with the mix, flatten the top with a pallet knife and run your thumb around the edge to remove any excess. Bake in a preheated oven at 300F/150ºC/Gas mark 2 - for 14 minutes or until risen. 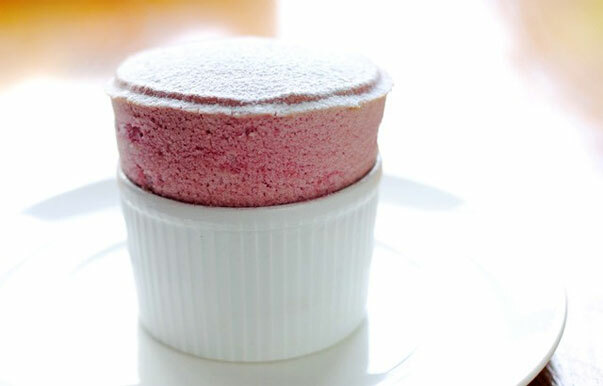 Dust the top of the soufflé with icing sugar and serve immediately. You can make the fruit purée ahead of time if you're having a party.